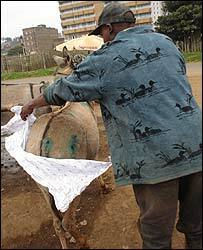 Donkey owners in the Kenyan town of Limuru are up in arms over an order from the municipal authorities that their animals must wear nappies. The council said the measure would come into effect on 16 July to ensure the town's streets are kept clean. But recent press coverage and outrage from the town's residents has led the authorities to put their plans on hold. Limuru's mayor, James Kuria, says: "We must come up with a way to make sure that the droppings are not a nuisance." Another donkey owner, Kimani Gathugu, who lives in the town some 50km north-west of the capital, Nairobi, says the measure is not practical and the council would do better to employ more street sweepers. Noting the vital role played by donkeys in the community, he says: "Donkeys are very important. Not many people have cars in the area and the donkeys serve as a mode of transport." 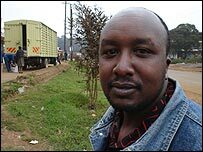 Another resident, John Kinyanjui, says: "The council itself has workers. They can do the sweeping. We are paying taxes." Water trader Simon Kamau, who uses donkeys to transport water to his clients utters: "In all the three years I have been in this business, I have never tied a nappy on a donkey. Mr Kuria though seems determined to push on with his plan. "I have heard that in some areas where they keep donkeys, they also have nappies," he said. "We will go to these areas and see how they do it and come back and show our people how to do it. We want the people to earn a living but at the same time we must keep our town clean."